It’s halftime at FedEx Field. No. 23 Texas is trailing Maryland, 24-22. It’s been a tale of two quarters. Today began looking like we’d stepped inside a time machine. But it only looked like the 2017 season opener. The Terps raced out to a 24-7 lead and looked like they were ready to put this one away, but the Longhorns caught fire toward the end of the first half, putting together one touchdown drive on he strength of their running game, then scoring on a safety and then finishing with a brilliant touchdown catch from Collin Johnson. So yes, Texas is trailing. But the momentum off that 15-0 spurt to close the first half has things humming at the break. Last year, the Terps led the Horns 30-14 at the break on their way to a 51-41 win. Besides that Texas scoring spurt, Maryland’s Jeshaun Jones has been the story of this game. The Terps’ true freshman has produced a first-half hat trick — he has run for a 28-yard touchdown, has caught a 65-yard touchdown and has thrown a 20-yard touchdown. 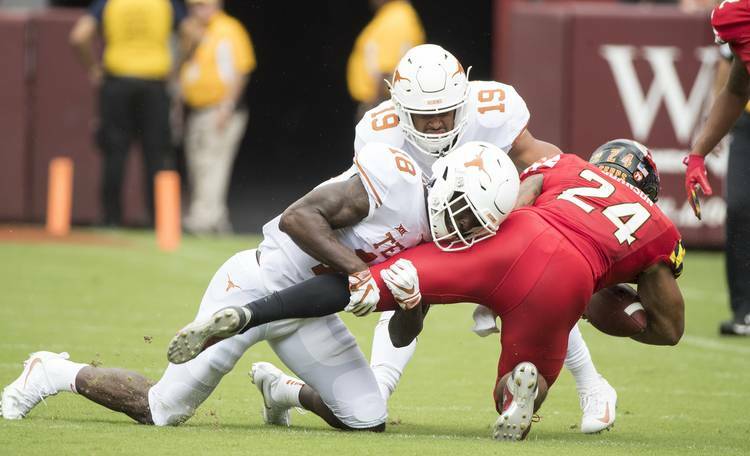 The Longhorns, meanwhile, have been all over the place: Up, down but mostly in between, an undisciplined first two quarters with a couple of big moments but generally marred by sloppy penalties and a lack of execution. It’s easy to forget the missteps because of the big ending to the half, but this first half is looking like a microcosm of 2017: Texas had problems running the ball, Sam Ehlinger missed receivers, there were mindless mistakes and the Terps were treating the defense like they did last September at DKR. But yeah, there also were two really nice touchdown passes that were topped by even better receptions on those plays by Devin Duvernay and Collin Johnson. And there was the safety. And the running game did offer a glimmer of hope on the second-to-last drive. Ehlinger’s first pass went to a true freshman — Brennan Eagles. It was thrown behind him and went incomplete. The second pass was a quick out to Lil’Jordan Humphrey, which went for no gain. And so, Texas’ first third down opportunity also went awry — an incompletion to Humphrey, though there was a first down because of a defensive holding penalty on the Terps. We got looks at each of the top running backs that are in contention to be the running game’s alpha back. No one has flashed. Tre Watson has 7 carries for 35 yards, Keaontay Ingram 6 for 37 and a TD, Daniel Young 3 for 2. Ehlinger is 9 of 15 for 147 yards and 2 TDs, but started out 2 of 6. Gary Johnson was ejected from the game early in the second quarter. He’s out for the rest of the game. Davante Davis left in the second quarter with an injury. He was replaced by Kobe Boyce, the redshirt freshman. Breckyn Hager was shaken up just before halftime, too. The Terps went up 17-7 early in the second on a drive that included a UT roughing the quarterback penalty, a UT pass interference penalty inside the 10, and a UT targeting penalty. Devin Duvernay had the play of the first half — a really nice diving catch in the end zone for a 39-yard touchdown. Collin Johnson’s late scoring catch was equally impressive. Cade Brewer’s back. The tight end caught a 13-yard pass in the second quarter and also laid the block on Ingram’s touchdown. Texas scored on a safety, a nice way to end the half for the defense. We originally had Ryan Bujcevski on that good list — his first punt went for a very Michael Dickson-like 56 yards. But things went south after that — 41, then 34, then a 15-yard shank that set up a Terps touchdown. There have been few moments to be happy about. Ehlinger and Duvernay hooked up for the long TD. Ingram scored his first college TD. Bujcevski’s soaring first punt had us all wondering what’s in the drinking water in Australia. Texas will get the ball to start the second half. Gary Johnson’s out for the game, but Anthony Wheeler — who had to sit out the first half because of a targeting penalty in the Texas Bowl win over Missouri — will be back.